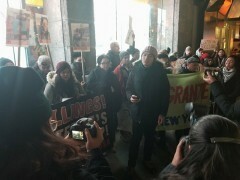 New York protest demands end to killings in the Philippines | Fight Back! New York, NY - On the evening of Dec. 10, approximately 70 activists gathered at the Philippine Consulate on 5th Avenue to protest the regime of President Duterte and to demand an end to its state-sanctioned mass killings. The rally was held on International Human Rights Day, a time to remember and reinforce the need for democracy and human rights, and to highlight the crimes against the people of the Philippines under the Duterte’s rule. Since Rodrigo Duterte took power there has been a wave of human rights abuses. It began with the Drug Wars, which Duterte claimed was a way to cleanse the Philippines of crimes, but instead were used to murder over 13,000 civilians. Second, Duterte has reinstated martial law in Mindanao, hurting indigenous people. Most recently, Duterte forces have murdered militant fighters for democracy and named the Communist Party of the Philippines (CPP) as a terrorist organization. The escalation of human rights abuses against people supporting the National Democratic movement began shortly after President Donald Trump’s visit. The rally aimed to stand in solidarity with those fighting the Philippines, remember the struggles of those who died at the hands of repression, and wage forward in the fight for liberation. The event was organized by Bayan USA and was attended by members of a multitude of different organizations such as: Migrante, Gabriella NY, Anakbayan NY and NJ, NYC Students for Justice in Palestine, Committee to Stop FBI Repression - NY, and the Samidoun Palestinian Prisoners Solidarity Network. Organizers used a projector to shine slogans onto the walls of the consulate with phrases such as, “Fight against the fascist U.S.-Duterte regime” throughout the night’s event.